Visit the Hornets Community Corner by section 112 during designated home games to play Mini Ball Mystery! 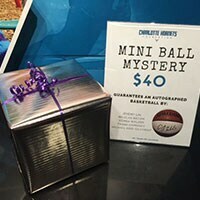 Mini balls are autographed by your favorite Hornets players and individually wrapped so that the player’s identity is a mystery until after purchase. 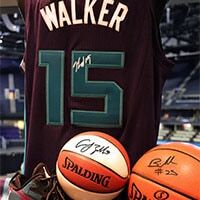 During the season, Charlotte Hornets Foundation hosts a weekly charity silent auction featuring one-of-a-kind sports memorabilia and experiences. Items are on display during each home game at the Hornets Community Corner by section 112. 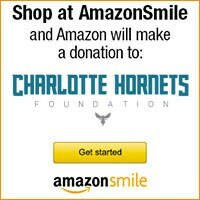 Shop AmazonSmile and select Charlotte Hornets Foundation to be the beneficiary of your shopping experience. Get your BUZZ CITY autographed ornaments in November and December at the Hornets Community Corner by section 112. How are you going to change your community? Want to give to the Foundation? Financial information about this organization and a copy of its license are available from the State Solicitation Licensing Branch at 919-807-2214. The license is not endorsed by the state. The foundation’s Federal Return of Organization Exempt From Income Tax or Form 990 is available upon request.